La familia Arriola Hernández vino a los Estados Unidos en los noventas y es originalmente de la Ciudad de México. Refugio llegó primero a los EEUU a continuar sus estudios y luego mandó por su esposa, Elvira. A poco tiempo Refugio aprendió que la vida estadounidense cuesta mucho y se encontró con la necesidad de trabajar por tiempo completo. Años después, Carmen la hermana de Elvira vino a San Francisco para reunirse con su ella y su esposo, y los tres compartieron un apartamento en 656-48 Capp St. Aquí en San Francisco, Carmen conoció a su esposo Mario Hernández y los dos se movieron a un studio debajo del apartamento de su hermana Elvira. La familia Arriola le gusta vivir en La Mission por la cultura y se siente muy agusto porque puede hablar su propio lenguaje, y ir de compras en tiendas y supermercados que llevan productos como los que conoce en México. También viven en una locación perfecta, están localizados muy cerca de transporte público y no necesita coche. Elvira y Refugio tienen dos hijas Gloria y Jessica. Gloria asiste John O’Connell High y Jessica en Cesar Chavez Elementary. Las dos escuelas son parte de La Comunidad Promesa de la Mission. En Cesar Chavez, la familia Arriola conocio a Yadira Diaz (foto, tercer derecha), Guia de Éxito Familiar de la Comunidad Promesa de La Mission. Elvira es una mamá voluntaria. Desde el 2006 Elvira es voluntaria en Cesar Chavez ayudando a las maestras en preparara sus materiales para la clases también es voluntaria en Buena Vista Horace Mann K-8 y John O’Connell High School. También apoya a Diaz cuando ofrece talleres de servicios a los padres. Elvira también es la vice-presidenta de ELAC (English Learners Advisory Council). Jessica y Gloria aprecian mucho a Elvira y les gusta pasar tiempo de calidad con sus mama y recibir su apoyo en la escuela. La familia Arriola Hernandez tiene una gran presencia en la Mission. Refugio, Carmen, y Mario trabajan en limpieza en la ciudad. Carmen también vende sus ricos tamales en el corazón de la Misión, y su esposo le ayuda a prepararlos. Después de 20 años de vivir en su hogar en la Mission la familia recibió una carta explicando que la dueña iba poner el edificio en venta. La familia Arriola Hernández es testigo del desalojo que está sucediendo en La Mission y tenía miedo que su futuro sería igual a los 8,000 Latinos que han sido desalojado de sus casas desde el 2000. La carta del dueño del edificio llegó como un golpe a la familia, rompiendo su tranquilidad con la realización que tal vez podría ser desalojado de su hogar. Refugio recuerda ese momento muy difícil, “no podíamos dormir ni comer. Me despertaba cada noche a las 2 o 3 de la mañana pensando en el futuro de mi familia. Pensé que nuestra única opción era volver a México.” El gran miedo de Refugio y Elvira era de quitarles a sus hijas la única casa que conocían y empezar un vida nueva en México. Después que MEDA compró el edificio, Refugio todavía recordaba lo sucedido y cómo su edificio tenía un rótulo de venta. Refugio y Castro de MEDA quitaron el anuncio juntos. Al final, Refugio y su familia pudieron dormir sin miedo y pudieron seguir sus vidas. Necesitamos crear más oportunidades para familias como la familia Arriola Hernández en la Misión, esta familia forma un componente importante de nuestra comunidad. The Arriola Hernandez family moved to the United States in the 1990s from Mexico City. Refugio Arriola was the first one to move to the U.S., seeking to continue his studies. The newcomer quickly learned that life in his adopted homeland was very expensive, forcing him to spend much of his time working just to keep pace. Once settled, he was reunited with his wife, Elvira, in San Francisco. A few years later, Elvira’s sister, Carmen, also moved to San Francisco to live with her sister and brother-in-law. The three shared an apartment at 656-48 Capp St. Carmen later met her husband, Mario Hernandez, and the pair moved into a studio on a floor below her sister. The Arriola family enjoys living in the Mission because of the culture: They feel comfortable here because they have the ability to speak their native language, plus go shopping in stores and supermarkets that carry products found back home in Mexico. Their apartment is in a perfect location, as living within walking distance to public transportation allows them to get around the city without the expense of owning a vehicle. Elvira and Refugio have two daughters attending Mission Promise Neighborhood schools: Gloria attends John O’Connell High School; and Jessica is a student at Cesar Chavez Elementary School. While volunteering at Cesar Chavez, Elvira met MPN Family Success Coach Yadira Diaz (photo, third right). Looking to give back to her community, Elvira has volunteered at Cesar Chavez elementary school since 2006, helping teachers prepare materials for class, plus supporting Diaz in the connection of families to free services. Additionally, Elvira also generously volunteers her time at Buena Vista Horace Mann K-8 (part of MPN’s planned expansion) and at John O’Connell; she even serves as vice president of ELAC (English Language Learners Advisory Council). Her daughters appreciate having their mom’s presence on their campuses, and all of the support she provides them in school. Refugio, Carmen and Mario work as janitors in the city, but on weekends Carmen and Mario also sell their delicious homemade tamales in the heart of the Mission. Clearly, the Arriola Hernandez family has big a presence in the community. Unfortunately, life in that Mission became more complicated when, after two decades of living in their apartment, the family received a letter explaining that the owners were putting the building up for sale. The Arriola Hernandez family was fearful for their future, as they had already seen the displacement taking place around them in the Mission. They hoped their lives would not change like the 8,000 Latinos that have been displaced from the Mission since 2000. Refugio looks back on this difficult time and laments, “I couldn’t sleep or eat. I would wake up around 2 or 3 in the morning thinking about the future of my family. I thought our only option would be to return to Mexico.” The family’s biggest fear was being compelled to remove their daughters from the only home they had known to have them start life anew in Mexico. Seeking a solution, Elvira reached out to Diaz, who connected the family to MPN partner MEDA’s Community Real Estate team. After their very first visit with MEDA, the Arriola Hernandez family took their first steps in working with MEDA so the nonprofit could buy the building via the City’s Small Sites Program. The family worked tirelessly to organize the neighbors in the building to ask the current owners to sell the building to MEDA. After much tenant hard work, letter writing and phone calls to the owners, the latter finally decided to sell the six-unit building to MEDA. Community Real Estate Project Assistant Juan Diego Castro explained that the family took on the responsibility of organizing the neighbors so that MEDA could buy the building and ensure that the tenants would not be displaced. The Arriola Hernandez family gave hope to the tenants during this difficult time, and remained to committed throughout the entire process. Without their help, none of this would have been possible. After MEDA bought the building, Refugio remembers taking down the large “For Sale” sign in front of the building — a sign that had caused everyone so much stress. Finally the Arriola Hernandez family could sleep without fear and continue their lives in the Mission. The opportunity gap needs to be closed for families, like this one, in the Mission, for they are an important part of our community. We need families like the Arriola Hernandezes, the thread that keeps the Mission together. They give back to the community and help make the Mission a brighter place to live. Luz Bourne-Ruiz is an energetic, single mother of 7-year-old Nathan, who attends Alvarado Elementary School in San Francisco. The immigrant from Mexico operates her own business, the New Alternatives Cafe, a cozy, neighborhood eatery serving breakfast and lunch on Guerrero near 28th. Featuring a convivial environment, there’s even a piano, guitar and congas for musically inclined customers to break out in spontaneous song after enjoying open-faced bagels and classic egg dishes. Bourne-Ruiz originally came to MEDA, the lead agency of the Mission Promise Neighborhood, seeking homeownership opportunities. She took the First-Time Homebuyers workshop — held in English and Spanish on the second Saturday of each month — to create stable, long-term housing for her small family. It was discovered that Bourne-Ruiz’s self-employment income, after expenses and deductions on her tax returns, was too low to obtain a sustainable below-market-rate (BMR) mortgage loan. Then Bourne-Ruiz’ worst fears were realized when her landlord stopped by last March with an ominous-looking letter: a 60-day eviction notice. When Bourne-Ruiz asked questions, the landlord stated coldly, “Everything you need to know is in the letter,” as he abruptly departed. This impending owner move-in meant Bourne-Ruiz and her child would soon be forced out of her beloved home of over a decade, with her foisted into one of the most pricey apartment-rental markets in the nation. Bourne-Ruiz was distressed, to say the least. That’s when Housing Opportunities Coach Diana Mayorga came into the picture, immediately ramping up efforts to get her client into a BMR rental. Bourne-Ruiz was already what MEDA deems rental ready, meaning she had a good credit score (must be better than 650), didn’t have any collections (must be under $500) and met BMR income guidelines for the developments to which she was applying (vary by property). When clients don’t meet these requirements, a MEDA coach works with them to develop a plan to become rental ready. Bourne-Ruiz simultaneously worked with Causa Justa :: Just Cause, located in MEDA’s Plaza Adelante neighborhood center, and successfully obtained an extension on her eviction timeframe. That community-based organization also helped her apply for the Displaced Tenant Housing Preference certificate through the San Francisco Mayor’s Office of Housing and Community Development (MOHCD). That preference greatly increases the odds of winning a BMR rental lottery. Mayorga assisted with submitting applications for numerous BMR rental properties: Sweeney Apartments in neighboring Daly City; and 480 Potrero, 125 Mason, 200 Buchanan, 280 Brighton and 1401 Mission, all in San Francisco. While this process can seem daunting, especially with an imminent eviction hanging over your head, Mayorga counseled Bourne-Ruiz to keep the faith, be patient and remain diligent. The good news? Bourne-Ruiz eventually won the lottery … on her sixth try. At the end of December, she and her son moved into 1401 Mission, which is a brand-new property called Olume in the community straddling the Mission-SoMa border. Olume was awarded “Best New Development of 2016” by the San Francisco Apartment Association. There’s a rooftop deck with 360-degree views of San Francisco. Fire pits to break the evening chill. Even an on-site pet park. Interiors are pretty swank, with everything from sliding bedroom doors to quartz kitchen countertops to vessel sinks in the bathroom. There are 18 BMR rentals, with Bourne-Ruiz’s rent affordable at around $1,250 per month for her family’s two-bedroom unit. “I am incredibly grateful for the City’s BMR rental program, as well as for the Mission Promise Neighborhood’s assistance in helping me apply for lotteries and coaching me about affordable-housing options. I am excited to be in my BMR apartment, which is safe, clean and new. My son loves it, too!” explains a grateful, and relieved, Bourne-Ruiz. “My teaching newcomers to San Francisco is like I’m coming home. I was in classes like these when I emigrated from the Philippines at age 5. It’s like I am helping myself,” explains Mission Promise Neighborhood teacher Jan Michelle Bautista of why she loves her job, and of the empathy she exhibits for her sixth- to eighth-grade science students at Everett Middle School. Raised in the Outer Richmond, Jan wanted to stay in the city she loved, but that created a major challenge on a teacher’s salary. In the summer of 2014, the 20-something was enjoying her new career while living solo in a $2,300 per month one-bedroom flat located Downtown. She tried coming up with ways to lower her rent, which ate up way too much of her take-home pay. There seemed to be no options – not in San Francisco, anyway. Few of Jan’s contemporaries inspired confidence around housing possibilities. It seemed as if only her engineer friends had been able to move out on their own, with most still being compelled to head outside of San Francisco. Everybody else was still living with their folks. Then Jan heard from Mission Promise Neighborhood Family Success Coach Roberto Aparicio, who is based at Everett and acts as a connector to free services in the community, that MEDA’s Housing Opportunities team was coming to the school to lead a First-Time Homebuyers workshop to avail teachers of how they could potentially buy a place in San Francisco. MEDA is the lead agency of the Mission Promise Neighborhood. Jan then took advantage of MEDA’s free one-on-one homeownership coaching. Castro also filled this role, going over Jan’s budget and then counseling her to move home for six months to save up for the rest of the needed downpayment. While Jan loves spending time with her extended family (really! ), she knew it would be tough moving back to her childhood home after having been on her own. Jan had a flashback as she once again shared a room with siblings, plus the home was crowded with three generations of the Bautista clan. Despite these drawbacks, Jan bit the bullet, hoping it would truly be temporary. It turns out Castro’s advice was pretty much spot on, as Jan closed on her new Nob Hill condo in February 2015, with a March move-in date. While Jan’s place is just 450 square feet and could use a kitchen remodel, it’s all hers. There is another price to pay: it’s very tough to come up with the monthly mortgage payment on a teacher’s salary alone, so the industrious new homeowner has taken a second job working at a local supermarket. The days are long, but she can now stay in the city where she teaches. That is not the case for most. With real estate site Zillow today showing a median rent of $4,425 and home price of $1.12 million, a teacher’s salary just won’t cut it in San Francisco. Jan knows that many of the teachers at Everett now live in Oakland or other East Bay locales, meaning a long commute. This can translate to not be able to attend student games, after-school events and educational meetings. “I look forward to my Professional Learning Communities meetings, which are held after school hours. These meetings are where I share resources with other English Language Development teachers. Because I live in San Francisco, I can come to these meetings. Fellow teachers who live in the East Bay are forced to make a choice each day about getting home at a reasonable hour or staying for these kind of events. This is especially difficult for those with children,” states Jan.
Then there is keeping a connection to the community in which you teach — important to Jan, and other teachers like her. For instance, Jan takes the bus to work, sometimes seeing parents and students also on the way to Everett. “I ask them if homework was done last night,” Jan kids. She also can relate to her students’ daily life experiences, heading to the same eateries, parks and museums. Jan knows that some dual-household-income Mission Promise Neighborhood teachers do not qualify for DALP or TND, as they make too much money to qualify, but do not earn enough to compete in San Francisco’s pricey market. This often means moving from the city. “SFUSD puts plenty of money into training teachers, but if they leave the city, that knowledge is lost. If teachers don’t leave because they went back to grad school, then they most likely had to move away because they were evicted or wanted to buy a place and could do so only elsewhere. That’s quite the loss for San Francisco,” concludes Jan, grateful to the Mission Promise Neighborhood for helping her be one of the enviable few who can actually live where they teach. On March 19th, Bryant Elementary in the Mission District played host to an insightful Housing Town Hall to bring the community together to express their concerns about the rising cost of San Francisco apartments. Turnout exceeded expectations—emblematic of the breadth of the issues facing lower-income families in the Mission. 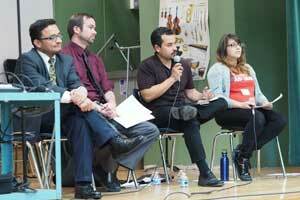 MEDA is 100% committed to pushing forward this much-needed dialogue about housing issues in the Mission . . . and last night was a step in the right direction. Conversations being had in kitchens across the Mission were brought into the public realm, with empathy now the common ingredient. Kudos to Claudia DeLarios Moran, San Francisco Unified School District Family Liaison, and other partners who worked collaboratively to make this meaningful event a reality. To get the conversation flowing, MEDA staff initially facilitated English- and Spanish-speaking groups of about six residents each. The consensus? Attendees lamented that they are caught in a Catch-22: move out of their long-time neighborhood of choice, or San Francisco altogether, because of escalating rents versus working two or more jobs just to pay shelter costs in the Mission, leading to less time with their children. Either scenario causes stress, taking the family unit on a downward spiral, with an outcome of psychological, emotional, physical and fiscal issues. Dr. Zea Malawa of Dr. Nadine Burke Harris’ Center for Youth Wellness, located in the nearby Bayview, gave a presentation on this dire matter. The event emcee was Hydra Mendoza, Education Advisor at City and County of San Francisco, with a translator on hand. The town hall panel comprised city officials Jeff Buckley, who is Senior Advisor to Mayor Lee, Supervisor David Campos and Supervisor Malia Cohen; complementing that trio were local activists Oscar Grande of People Organizing to Demand Environmental &amp; Economic Rights (PODER) and Lucia Kimble from Causa Justa :: Just Cause. The panel answered questions from residents and vowed to transfer the latter’s concerns into action. MEDA plays its part via the Mission Promise Neighborhood, an evidence-based continuum of services that focuses on lower-income Latino students and their families at Bryant Elementary, César Chávez Elementary, Everett Middle School and O’Connell High School. Family Success Coaches work to keep children and their families on the path to success. The dedicated MEDA team promises to keep pushing the dialogue. MEDA is all about solutions.